I really like baseball. I enjoy movies set in the American suburbs. I've been known to partake in a good old fahioned wallow in nostalgia. 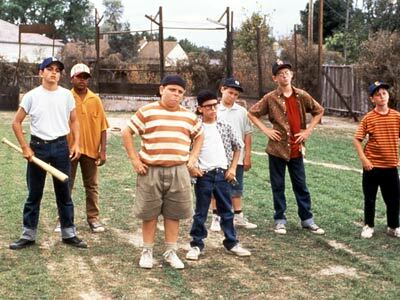 I should, therefore have been the ideal viewer for this film, a nostalgic look back at the adventures of a group of baseball-mad kids, living in suburban LA in the early '60s. Unfortunately, it just didn't work for me. For one thing, the kids in question were just too damned shrill - there's a whole gang of them, and quite frequently the film descends into the kind of screeching contest that only Father Noel Furlong could enjoy. For another thing, while the film is obviously aimed at kids, so perhaps it shouldn't be held to the same standards of historical accuracy as a more 'serious' picture, America's racial troubles have been airbrushed out of its portrayal of the past. The gang which Scotty hangs around with contains kids of various different ethnicities (white, black, Latino etc. ), yet this doesn't draw a comment from anyone they encounter - this seems a little unlikely in the early '60s, even in California. Of perhaps more concern is the fact that the conclusion of the movie sees Scotty and pals meeting up with a former professional baseball player played by James Earl Jones, who has photographic evidence proving he played alongside Babe Ruth back in the 1930s. As someone who spent 18 hours watching Ken Burns' excellent Baseball documentary, I'm pretty sure that no black players were allowed to play major league baseball until Jackie Robinson was signed by the Brooklyn Dodgers in 1947. Finally, the actions of the central character (Scotty), which drive the plot, don't appear to make much sense. What 12 year old American kid has never heard of Babe Ruth? Even if he hadn't heard of Babe Ruth, it's pretty obvious that his stepfather's trophy ball is valuable, so why would he steal it instead of coming up with the 99 cents needed to buy a new one? I suppose I shouldn't be too harsh on the film - looking at the IMDB page for it, it's got plenty of vocal fans, so I may well be missing something - but I'm probably too old to appreciate it at my ripe old age (29). This movie was the first part of my Sunday night 'Kate Winslet is sick' double bill. 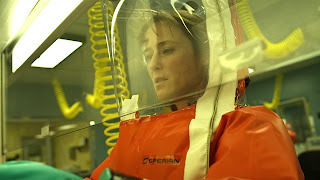 The ensemble drama is a chillingly realistic disaster picture, showing what might happen if an epidemic of a deadly new disease were to spread across the world. Rather than focussing on any one location, director Steven Soderbergh moves from Hong Kong to London to Minneapolis and Chicago, showing the effects of the rapidly spreading disease on the people in those cities. Just as deadly as the virus itself is the panic which it causes amongst the stricken populace, with angry mobs turning to looting and violence in an effort to get hold of medical supplies. Soderbergh put together a particularly impressive collection of actors for this project - including Gwyneth Paltrow, Matt Damon, Kate Winslet, Laurence Fishburne and Marion Cotillard, all of whom put in solid work in their roles. On the whole, the move worked for me - it avoids a sensationalist portrayal of the epidemic, and gives a real sense of the global scale of the outbreak, while still giving the viewer some engaging characters to empathise with. Unfortunately, Contagion does have a serious flaw: Alan Krumwiede, the blogger played by Jude Law. I'm not sure why old Jude decided to give his character a terrible Australian accent and distractingly fake looking 'bad teeth' (when these things have no relevance to the character he's playing), but these bizarre touches mean that any scene featuring Krumwiede are frequently unintentionally hilarious, and detract from what is otherwise a very good picture. So, this was part two of 'Kate Winslet is sick' double bill, though on this occasion, she's sick in the head, rather than the body. 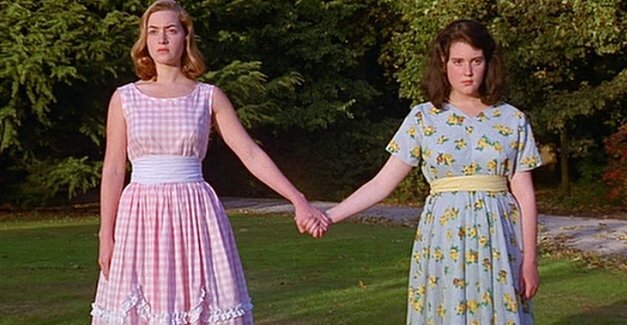 Based on a real life story which scandalised New Zealand in the 1950s, Heavenly Creatures tells the story of Pauline Parker and Juliet Hulme. The pair were best friends, who developed a made up paradise called Borovnia into which they could retreat, a place in which they are able to escape their humdrum existence as school outcasts and live with their heroes - Mario Lanza and Orson Welles. However, the two schoolgirls' unhealthy attachment to one another would ultimately lead them to commit a shocking crime... This was Peter Jackson's first 'serious' film, but despite the rather grim nature of the subject matter, he is able to bring along a sense of humour to proceedings (which was also present in his brilliant early zombie picture Braindead), as well as some imaginative and well realised sequences set in the girls' fantasy world. It was also Kate Winslet's first major screen role, and she's very good as Juliet, the more outgoing and vivacious of the pair. For me though, she is outshone by Melanie Lynskey, who oozes resentment and hurt as the passive-aggressive Pauline. An excellent film.